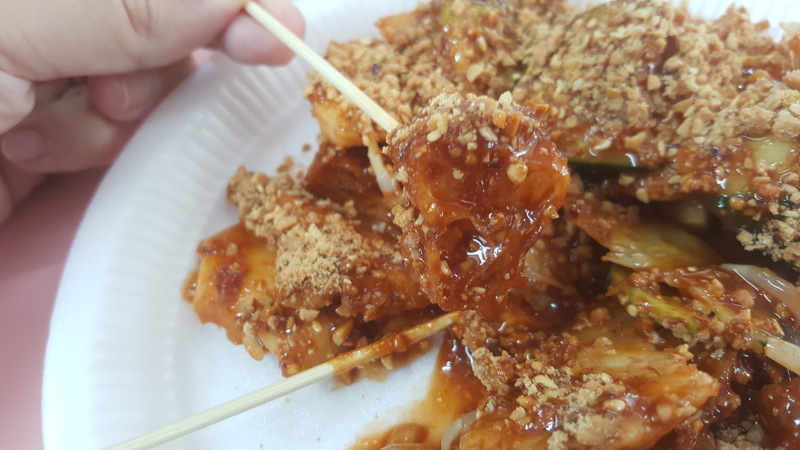 “You must try rojak before you leave Singapore” some crazy person said to me at some point. So with my days dwindling down on the red dot I wandered many a hawker centre and decreed that if I saw it I would eat it. I saw it. I tried to eat it. 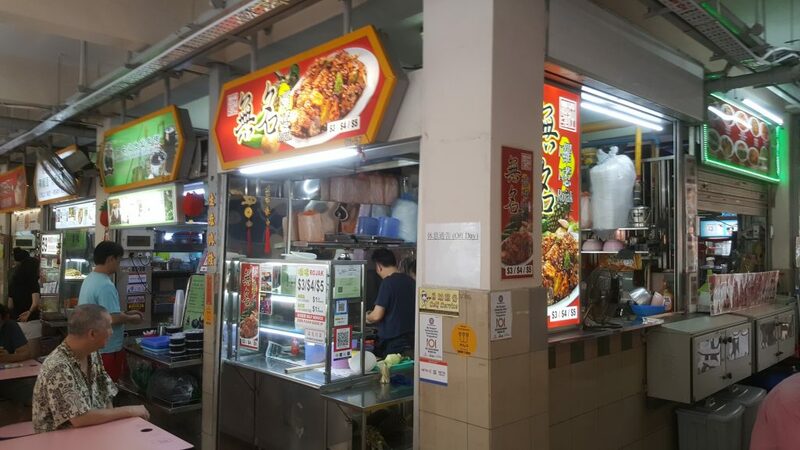 The venue was the Golden Mile Food Centre on Beach Road which is quite a large eatery you can browse through to find your poison. I found rojak. Rojak is a fruit and vegetable dish. 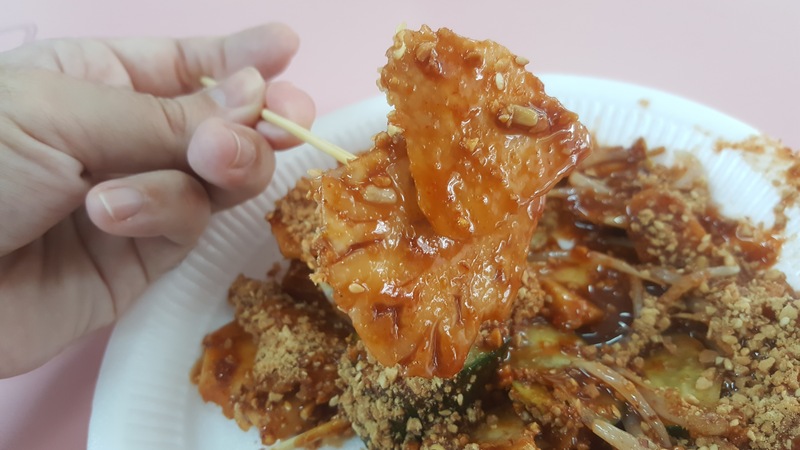 Rojak means “mixture” in Malay. It’s a mixture of fruits and vegetables but it’s totally ensconced in a gritty paste mixture of water, shrimp paste, sugar, chili, and lime juice. 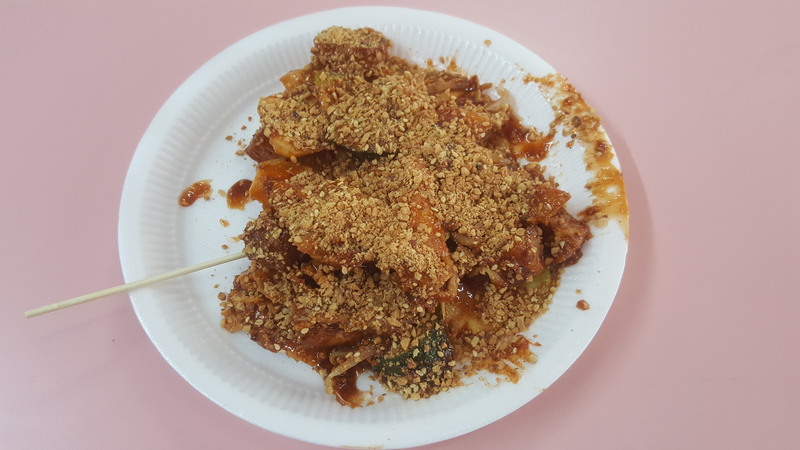 Singapore rojak tends to have cucumber, pineapple, puffy, deep-fried tofu and youtiao (cut-up Chinese-style fritters) and raw mangos and green apples. All topped atop with crushed peanuts. They were all apparent in my dish in abundance. At first, I was surprised by the taste and I thought I actually liked it. That passed. I just didn’t like the combination of contrasts between sweet and sour and fruity and savoury. I chose the $4 dish which was the equivalent of a Starbucks Grande. I guess. I valiantly tried to battle my way through it and attempted to find a combination of tastes that I liked. I kind of liked the apple bits and the tofu bits but that’s if you forced me. Anyway, sadly, this was one of the last dishes I tried and it was my least favourite. But I’m glad I tried it. Like I tried to ride a skateboard once. I won’t be trying it again. It’s just not nice. But try it if you like the culinary clash of sweet and savoury from time to time.